She is able to joke now that it was a sneeze, and not a push, that led to her daughter’s birth. But at the time, Nobue Yamaguchi Jones was stunned to have given birth at only 25 weeks pregnant. Equally shocking was just how small the newborn girl was: 380 grams, just over three quarters of a pound. Lillian Yamaguchi Jones had become the smallest baby Royal Columbian Hospital’s neonatal intensive care team ever had to support. Lillian at age 2, playing with her parents. To Nobue’s surprise, the doctor who examined her found the mother-to-be was dilating. The contractions started soon after. “After that, the doctor admitted me to bed rest,” says Nobue. Having undergone in vitro fertilisation, the Coquitlam resident and nurse had been attuned to the potential complications of a pregnancy. But this was all happening so fast. Three hours after her arrival to the hospital, Nobue was now hoping to delay the delivery as long as possible. Her situation, however, was about to become much more urgent. Just before midnight, Nobue left the bed to go to the bathroom. That’s when she sneezed. As the medical team made plans for an emergency C-section, Nobue and her husband Ennis tried to remain calm. Nobue vividly remembers one doctor taking her by the hand to tell her she was doing great. That’s when all her emotions came to the surface. “I just burst into tears,” she recalls. Left: Lillian Yamaguchi Jones, resting her hand on her father’s finger. 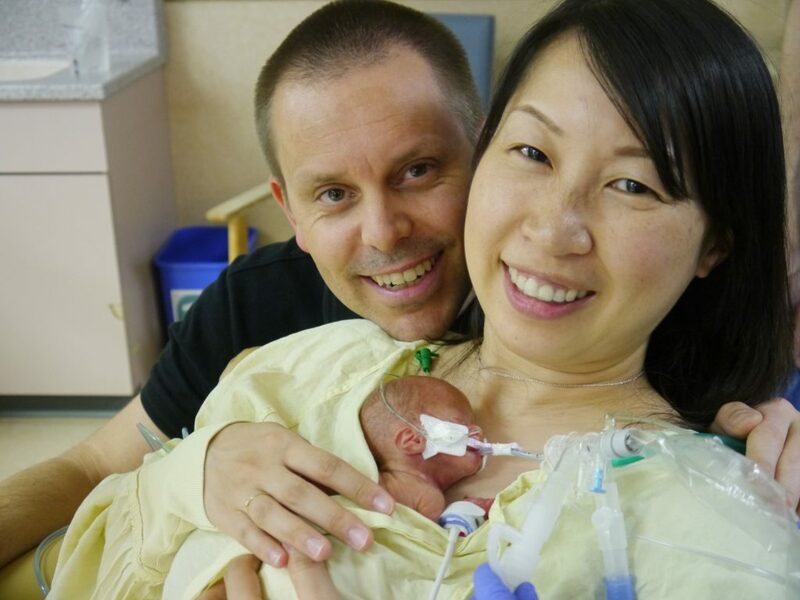 Right: Lillian and parents Ennis and Nobue doing skin-to-skin in the neonatal intensive care unit. The neonatal intensive care team quickly took over care of Lillian after she was born. Lillian spent the next 156 days under the care of the neonatal intensive care unit, which is one of four in the province prepared to care for extremely premature babies. Gradually, Lillian became stronger and healthier. “Being able to do a little bit more than the day before, it gave us hope and happiness,” says Nobue. Nobue has high praise for the care given to the entire family. Two years later, Nobue says her little girl is doing great. Despite still needing help to eat, Lillian is walking, talking and playing.